The ideal in-flight outfit: comfy basics with your fluffiest sweater. You’ll stay warm on the go and save room in your suitcase for other essentials. Buy it: Aerie Chunky Sweater, $50; aerie.com. Mavi Alexa Mid Soft Gold Lux Move Jeans, $148; us.mavi.com. Buji Baja Chic Muffler Scarf, $78; revolve.com. Kenneth Cole Kam Leather Sneakers, $125; kennethcole.com. 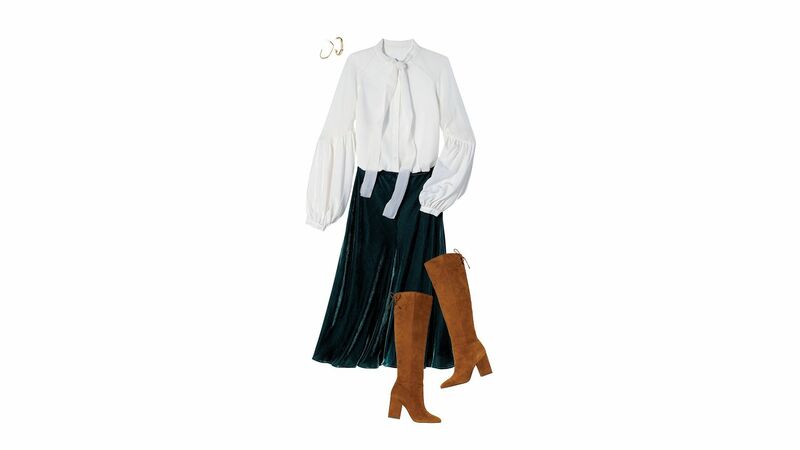 If you normally wear ankle- or calf-height boots with skirts, consider over-the-knee this season. It’s a more modern look, and you can skip tights. When you arrive at your destination, hang silky items (like this blouse) in the bathroom so wrinkles release as you shower. Buy it: 7 For All Mankind Bow Tie Blouse, $189; 7forallmankind.com. Eileen Fisher Velvet Flare Skirt, $278; neimanmarcus.com. Vince Camuto Sarelia Boots, $180; nordstrom.com. Mixed textures prevent an all-black look from feeling dull: Here, it’s faux leather and feathers. 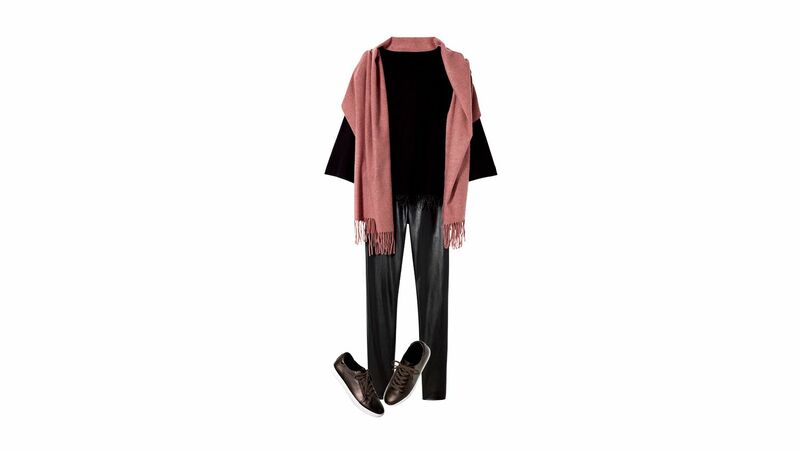 Add color—and stay toasty!—with an oversize scarf. 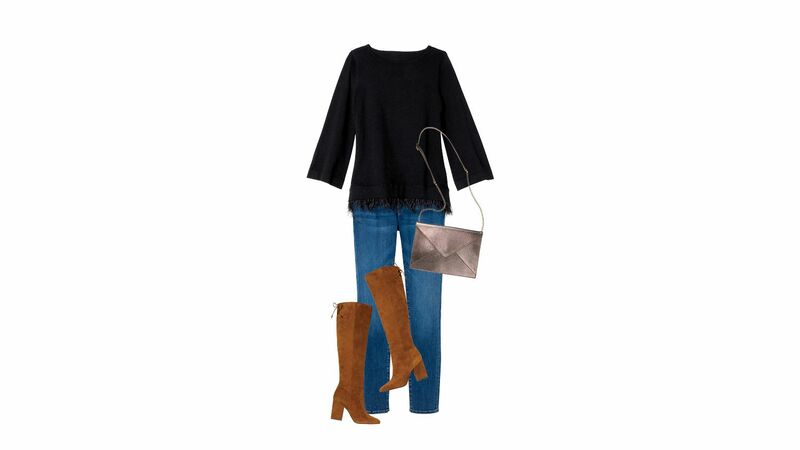 Buy it: Chico’s Feather Hem Pullover, $109; chicos.com. R Label by TheReset.com Vegan Leather Leggings, $155; thereset.com. The perfect uniform for an indulgent meal? 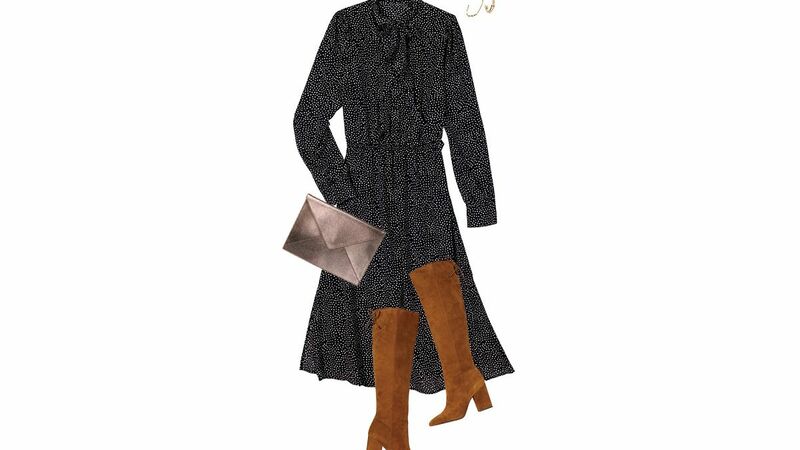 A flowy dress with a stretchy waistband, paired with walkable boots for your post-dinner stroll. Shiny accessories keep things festive. Buy it: Lulus Polka Dot Long Sleeve Midi Dress, $67; lulus.com. Real Simple Style Marilyn Envelope Clutch, $108; realsimplestyle.com. 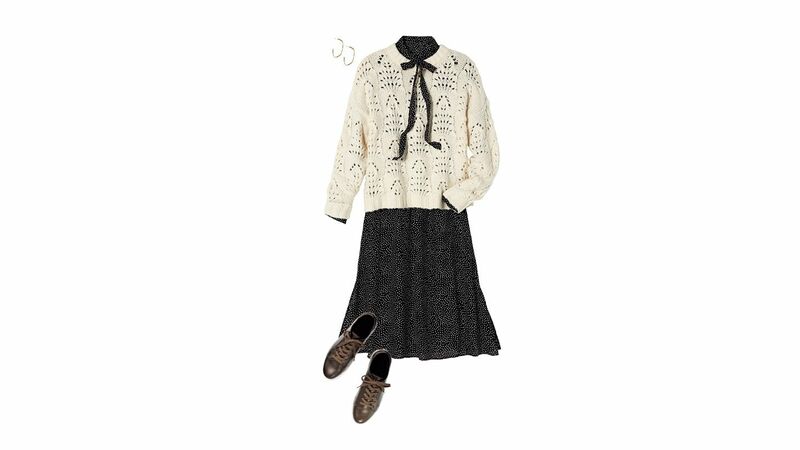 A fancy dress gets another wear in a less formal outfit when you add a relaxed sweater and sneaks. Be sure to let the collar and bow peek through. Aerie Chunky Sweater, $50; aerie.com. Match up the jeans and feathery top for a comfortable combo that still looks sharp in family photos. The clutch converts to a crossbody: Voilà—it’s now a daytime bag.